Microsoft recently unveiled several of their latest projects at a live event. 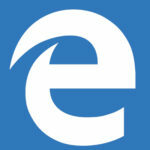 As expected, there was a lot of attention directed towards the new Windows operating system, Windows 10, and to their in-development browser Spartan. What was not expected was that Microsoft would show off was a slew of brand spanking new consumer technologies. Device Versatility: We already know that Windows 10 is designed for multiple different devices, but Myerson went on to explain how it’s designed to let you switch applications between devices at will, so productivity can flow without a hitch. 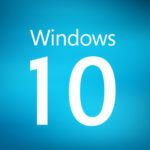 Privacy and Consumer Relationships: At the beginning of the presentation, Myerson revealed that Windows 10 is designed with enterprise in mind. He even went as far as stating that the security built into Windows 10 would have been strong enough to stop some of the hacking attacks which seemed to fill 2014. This explanation barely scratched the surface. Let’s take a look at some of the finer points of the Microsoft live event. The artificial intelligence inspired by the Halo video game series makes a triumphant return on Windows devices; this time, not as a simple voice interaction system like the one found on Windows Phone 8.1, but as a full-fledged feature on all Windows 10 devices. 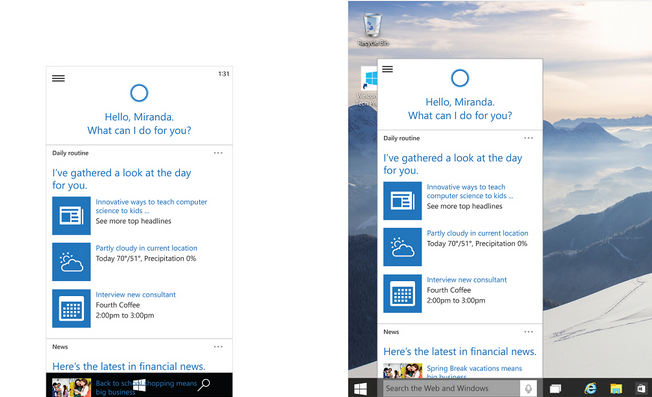 Cortana is meant to be a personal assistant of sorts, just like Apple’s Siri and Android’s Google Now. Cortana can add events to your calendar, send emails to specific contacts, and so on. You only need to express your desire, and she performs the act automatically. How useful will this feature be? Only time can tell. On a mobile device, Windows 10 looks extraordinarily like Windows Phone 8.1. However, the neat thing about Windows 10 is that it can run mobile versions of Microsoft Word, PowerPoint, and Excel. 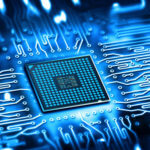 Joe Belfiore, the Corporate VP of Operating Systems at Microsoft, compares these apps to those found on the desktop version, and there are hardly any differences at all. Clearly, Microsoft was serious when they said they wanted one Windows for all devices. 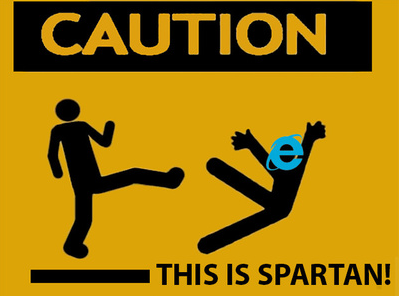 Not too long ago Microsoft revealed that they were developing a new web browser to be released with Windows 10 codenamed Spartan. As expected, it has a sleek design similar to other dynamic browsers on the market, like Google Chrome and Mozilla Firefox. This time around, Microsoft showed off note-taking features within Spartan. Users can write and draw notes and shapes right on the web page, which might be useful in the professional environment. Plus, just like other parts of Windows 10, Cortana is built right into the browser, allowing for quick and easy searching. Cortana can even display information about the topic searched, like its location. Along with Windows 10, Microsoft also revealed its plans for upcoming consumer technology. 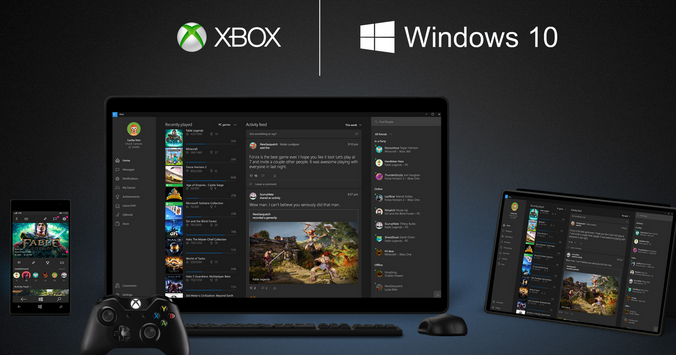 Avid gamers will be happy to know that the Xbox One will be able to stream directly to all Windows 10 devices. Additionally, Microsoft revealed its new Xbox app for Windows 10 devices. It kind of looks like a Facebook for gaming, with news feeds and such. Users can see what games are currently being played by the people in their network. Microsoft also showed off its new Surface Hub. It might look like a huge TV, but it’s really more of a huge Surface tablet, in a sense. It’s meant to be used as a whiteboard for meetings. Users can take notes and utilize Skype integration to perform video conferencing calls. It can potentially be a valuable asset to the modern office, but only time can tell whether it will truly be as innovative as it claims. Perhaps the most interesting part of this live event was the reveal of the HoloLens, which is just as cool as it sounds. While it might look like another attempt at a heads-up display (like the failed, and recently-discontinued Google Glass), the HoloLens is a bit different. In fact, it’s even vastly different from the virtual reality provided by the Oculus Rift headset. Instead of making you see a virtual reality, the HoloLens lets you see your reality with virtual elements integrated directly into it via holograms. Microsoft promised big things were coming with Windows 10, and it looks like they were being serious. 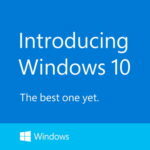 The new operating system looks to be one of the most anticipated versions since Windows 7. 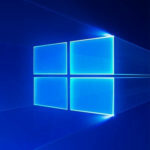 In fact, users of Windows 7, Windows 8.1, and Windows Phone 8.1 will be happy to hear that Microsoft is offering a free upgrade to Windows 10 if you purchase the software directly from them. However, this freebie is limited to one year following the release of Windows 10, so be sure to keep an eye out for the release date. Now that Windows 10 can be seen a bit more clearly, what do you think about it? Are there any features you like the most? Let us know in the comments.